Duplicate questions are still rampant on SOFU, despite the Related Questions list. I propose that in order to display more relevant questions in the list, the tags given for the new question should be taken into account. If a questions doesn't share any tags with the question I'm about to ask, it's highly unlikely that the question is related. Similarly, if a question shares many tags in common, that question is more likely to be related. "How can I get the End key to move the cursor to the end of the current line in Xcode?" I found the key bindings preferences, so I didn't actually ask it, but the list of Related Questions included questions about jQuery, vim, the CSS propery cursor:move, how to count lines using awk, and several other totally unrelated questions. Of the 25 listed questions, 5 were about shortcuts or cursor movement in Xcode. If the list had taken a look at my tags (xcode keyboard-shortcuts not-programming-related tools) it would have been able to give a much more accurate list of questions, and omitted the questions that were unrelated. Next time you ask a question, read over the list and and count how many questions share a tag (or more) and whether or not other questions were of relevance. How does this help avoid Duplicates? Since the tags would narrow the list of questions down, fewer related questions could be listed for the user. If the list were shorter, users would be more likely to read through it and would therefor be more likely to find an a duplicate question in the list. Of course, this feature would work best when users use the correct tags for their question. To continue to help users that do not tag ideally, we may not want to completely bar questions that don't share tags from showing up. Currently, the tags are entered below the question description. In order for users to know that their tags are involved in the Related Questions search, it may be more intuitive to place the tag input above the Related Questions list. Alternatively, the Related Questions list could display a message such as: "Enter a tag to search for Related Questions." until the user enters tags. However, I don't support re-ordering the form; I think title, then body, then tags is the best flow. I agree that assuming a mostly accurate tag list (which is assuming a lot in some cases), using the tags should help create a better related question list and (hopefully) reduce the number of duplicate questions. I would hope that this would key in some of the ... semi-engaged thinkers ... that the title and tags are two different things, and that replicating the title in the tags doesn't help much. But that may just be wishful thinking on my part. Not the answer you're looking for? 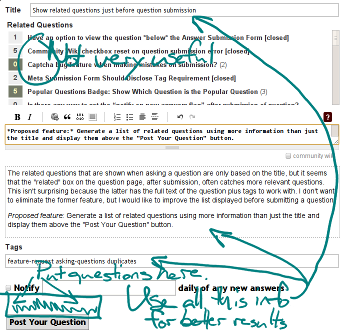 Browse other questions tagged feature-request status-completed tags related-questions . Can we adjust the “Related Questions” according to entered tags? Is asking dupes considered “bad behavior”? Better “Ask a question” suggestion results?